Chip and Joanna have made a name for themselves in the home improvement and furniture industry with their hit show "Fixer Upper" on HGTV and their Magnolia Series of home decor products. Their attention to detail and quality led them to Smoky Mountain Wood Products and we are proud to have been a part of their projects. White Pine tongue and groove, yellow pine flooring, white pine trim and any other log home accent you could possibly need all in one store. We offer a full line of timber frame and log home options including construction hardware such as screws, caulk and dowels, Perma Chink stains and our personal line of Revolution Hardwood Flooring. Check out our many options and please feel free to give us a call or simply email us with any questions. Smoky Mountain Wood Products has Eastern White Pine siding, Eastern White Pine logs and Perma Chink Stains to turn any dream into a reality. We also offer Western Red Cedar beams and posts in many different sizes and finishes. We offer nationwide shipping from our locations in both Tennessee and Georgia. Browse our site and see why Smoky Mountain Wood Products is your clear choice for building supplies. From porch posts to heavy timber rafters, Smoky Mountain Wood Products offers a variety of White Pine and Cedar Timbers to fit your need. 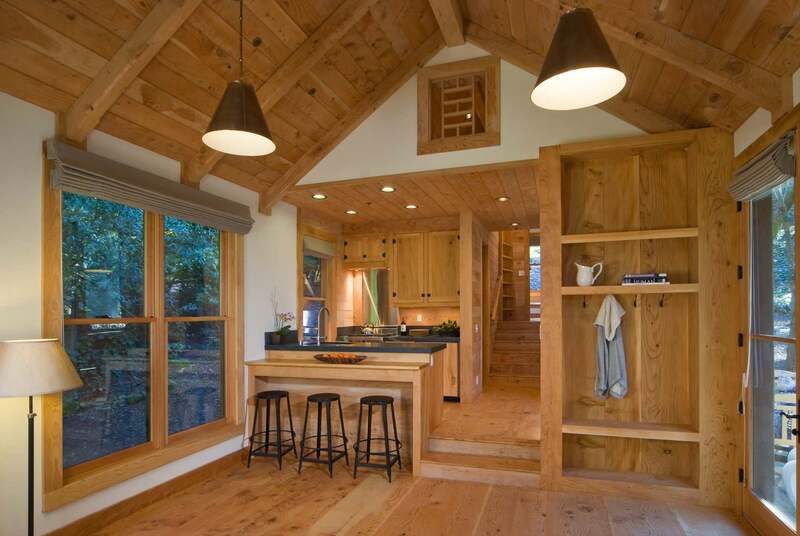 We specialize in Eastern White Pine logs and beams and a vast selection of Western Red Cedar beams. We offer custom sawing and can provide that made to order accent piece you are looking for. Pricing is available under our Log Packages link. Where Quality Products Meet Quality People. 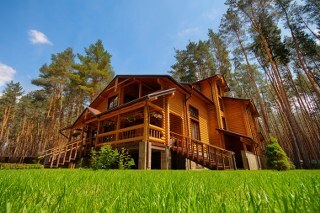 Log home packages and "log home kits" come in many different shapes and sizes. Smoky Mtn Wood Products can put together a kiln dried eastern white pine log package to meet your individual needs. Why buy what everyone is selling when you can buy exactly what you need? Having over 30 years experience in the log home industry, we can put together exactly what you need without all the fluff. We offer our log packages with D-log profiles in 6” and 8” widths and “square” logs with or without chink grooves in 6x12 and 8x12. We also offer tours of our indoor milling facility to give you peace of mind when purchasing your new log home. Check out the Smoky Mountain difference. friendly service and exceptionally high quality products. Red Cedar, along with various options in Spruce, Cypress and Douglas Fir. Our products range from a 1x4 piece of trim to an 8x12 timber beam. decking. We strive to provide high quality products with friendly service. 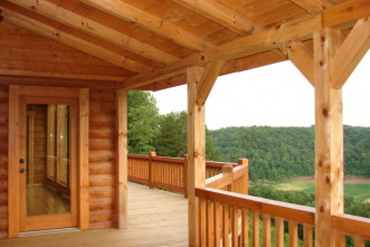 We offer a full line of Perma-Chink Stains & Sealants, along with other log home supply needs. From caulking to foam inserts Perma-Chink has a variety of quality products. Flooring prices are per Square Foot (SQ FT). All other Wood Products are priced per Linear Foot (LN FT). Call to confirm prices. All or any price is subject to change without notice. Wood Flooring is the only wood product priced PER Square Foot. All other wood products are priced PER Linear Foot. The window below Sq. Ft . is to plug in your desired square footage, then click the button Add To Quote . The web-site will send to us an email with a list of your desired products. We will issue a price quote and send it to you via Your email address. Please don’t hesitate to call with other questions. 1-706-463-5116. Periodic updates will be made to the web-site as needed.